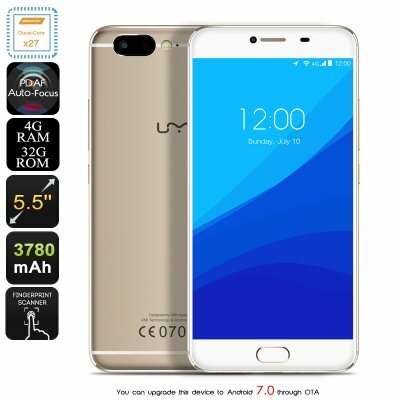 Successfully Added UMi Z Android Smartphone - Deca-Core Helio X27 CPU, 4GB RAM, 4G, Supports Android 7.0, 13MP Camera (Gold) to your Shopping Cart. The UMi Z smartphone is the latest Android phone announced by this well-trusted Chinese smartphone manufacturer and is seen as the first flagship smartphone that will be available in 2017. Not only does this Android phone feature an absolutely stunning design, it also holds some of the latest software and hardware alike that allow you to truly undergo a smartphone experience like never before. Being among the first smartphones that features the Deca-Core Helio X27 chipset that has been clocked at 2.6GHz, this Android phone is guaranteed to treat you with an exceptionally fast and powerful performance that allows you to enjoy the latest and most demanding games and applications alike without dropping a frame. Added to that, this Chinese smartphone packs a stunning 4GB of RAM – letting you engage in excessive multitasking sessions without ever slowing down your Android device. The UMi Z smartphone is the perfect Android phone that is guaranteed to meet the needs of even the most demanding smartphone users out there. This latest Android smartphone runs on an Android 7.0 operating system . Being able to enjoy the latest Android OS will allow you to take advantage of the most up to date features and software the industry has to offer – truly taking your mobile user experience to the next level. Along with its sleek yet powerful 3780mAh battery, the UMi Z Android phone supports a continuous usage time up to 20 hours – ensuring that you’ll get through multiple days of excessive smartphone usage without ever needing to spend a single second on recharging your device. Whether you like to browse the web, play games, or enjoy the benefits of the latest mobile applications – this Chinese Android phone packs plenty of juice for you to fill up your day with all the mobile entertainment of your liking. Holding two 4G SIM card slots and supporting Dual-IMEI numbers, the UMi Z Smartphone allow you to take your connectivity to the next level. No matter where on the globe you’re located, with this Chinese smartphone, you’ll always be able to enjoy the fastest data speeds out there and stay connected to your friends, family, and colleagues back home. Download files in the blink of an eye and stream Full-HD movies at lightning speeds – nothing is too much for this 4G smartphone. At the back of this Android smartphone, you are not only able to find a state of the art fingerprint scanner but also a magnificent 13MP Samsung camera that fully supports professional-grade smartphone photography. Being able to shoot breathtaking images and recording mesmerizing 4K video, the UMi Z assures that from now on not a single special moment in life passes by uncaptured. The phone’s beautiful 5.5-Inch FHD display allows you to instantly watch back and review all your pictures and recordings in stunning detail and vivid color – ensuring that once you get back home from your upcoming holiday your smartphone will be filled with beautiful top-level footage of all the adventures that are ready to be shared with all your friends, family, and loved ones. The UMi Z smartphone comes with a 12 months warranty, brought to you by the leader in electronic devices as well as wholesale electronic gadgets..
Arabic: - الهاتف الذكي 5.5 بوصة - Chinese Simplified: - 5.5 英寸智能手机 - Czech: - 5, 5palcový Smartphone - Dutch: - 5.5-inch-Smartphone - French: - Smartphone de 5,5 pouces - German: - 5,5-Zoll-Smartphone - Hebrew: - 5.5 אינץ החכם - Hindi: - 5.5-इंच स्मार्टफोन - Hungarian: - 5.5-os okostelefon - Italian: - 5,5 pollici Smartphone - Japanese: - 5.5 インチのスマート フォン - Korean: - 5.5 인치 스마트폰 - Malay: - Telefon pintar inci 5.5 - Norwegian Bokmål: - 5.5-tommers Smartphone - Romanian: - Smartphone de 5,5 inchi - Russian: - 5,5 дюймовый смартфон - Spanish: - 5.5-inch Smartphone - Thai: - สมาร์ทโฟนขนาด 5.5 นิ้ว - Turkish: - 5.5 inçlik Smartphone - Vietnamese: - 5.5-Inch Smartphone. Will this work on Verizons network? Will it work on Verizons network. I do not own this phone - but after seeing it presented in the youtube video by ChinaVision I am seriously considering buying to make it my next phone. ChinaVison always is on the cutting edge bring and presenting new and exciting products. Their video was very informative and answered all questions I had on this product. I look forward to seeing more on this phone. THanks!